Peter Lynch is one of the great investment managers of all time. He managed the Fidelity Magellan Fund for 13 years with assets under management rising from $20 million to $13 billion by the time Mr. Lynch retired. Under his managment the fund returned an average of 29% per year for 13 years. If you invested $10,000 in Magellan Fund when Lynch took over managment it would have grown to $280,000 13 years later. Mr. Lynch is also famous for introduction of PEG. PEG is a ratio he used to determine if a stock was cheap, why’ll keep growth in mind. The PEG ratio is determined by the dividing the company’s P/E ratio by the historical growth rate. According to Mr. Lynch the faster the company grows, the higher the P/E ratio you should pay for that company. He wrote two best-selling books that every investor should read, whether they are growth investors or value investors. 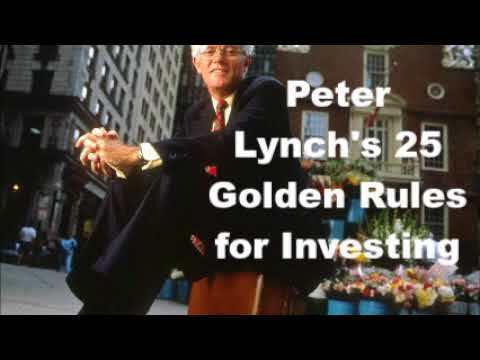 Beating the Street (published in 1993), Lynch left investors with the following list of golden rules – 25 in all. Rule 1: Investing is fun and exciting, but dangerous if you don’t do any work. Rule 2: Your investor’s edge is not something you get from Wall Street experts. It’s something you already have. You can outperform the experts if you use your edge by investing in companies or industries you already understand. Rule 3: Over the past 3 decades, the stock market has come to be dominated by a herd of professional investors. Contrary to popular belief, this makes it easier for the amateur investor. You can beat the market by ignoring the herd. Rule 4: Behind every stock is a company. Find out what it’s doing. Rule 5: Often, there is no correlation between the success of a company’s operations and the success of its stock over a few months or even a few years. In the long term, there is a 100% correlation between the success of the company and the success of its stock. This disparity is the key to making money; it pays to be patient, and to own successful companies. Rule 6: You have to know what you own, and why you own it. “This baby is a cinch to go up” doesn’t count. Rule 7: Long shots almost always miss the mark. Rule 8: Owning stocks is like having children – don’t get involved with more than you can handle. The part-time stockpicker probably has time to follow 8-12 companies, and to buy and sell shares as conditions warrant. There don’t have to be more than 5 companies in the portfolio at any one time. Rule 9: If you can’t find any companies that you think are attractive, put your money in the bank until you discover some. Rule 10: Never invest in a company without understanding its finances. The biggest losses in stocks come from companies with poor balance sheets. Always look at the balance sheet to see if a company is solvent before you risk your money on it. Rule 11: Avoid hot stocks in hot industries. Great companies in cold, non-growth industries are consistent big winners. Rule 12: With small companies, you are better off to wait until they turn a profit before you invest. Rule 13: If you are thinking of investing in a troubled industry, buy the companies with staying power. Also, wait for the industry to show signs of revival. Buggy whips and radio tubes were troubled industries that never came back. Rule 14: If you invest $1000 in a stock, all you can lose is $1000, but you stand to gain $10,000 or even $50,000 over time if you are patient. The average person can concentrate on a few good companies, while the fund manager is forced to diversify. By owning too many stocks, you lose this advantage of concentration. It only takes a handful of big winners to make a lifetime of investing worthwhile. Rule 15: In every industry and every region of the country, the observant amateur can find great growth companies long before the professionals have discovered them. Rule 16: A stock market decline is as routine as a January blizzard in Colorado. If you are prepared, it can’t hurt you. A decline is a great opportunity to pick up the bargains left behind by investors who are fleeing the storm in panic. Rule 17: Everyone has the brainpower to make money in stocks. Not everyone has the stomach. If you are susceptible to selling everything in a panic, you ought to avoid stocks and stock mutual funds altogether. Rule 18: There is always something to worry about. Avoid weekend thinking and ignore the latest dire predictions of the newscasters. Sell a stock because the company’s fundamentals deteriorate, not because the sky is falling. Rule 19: Nobody can predict interest rates, the future direction of the economy, or the stock market, Dismiss all such forecasts and concentrate on what’s actually happening to the companies in which you have invested. Rule 20: If you study 10 companies, you will find 1 for which the story is better than expected. If you study 50, you’ll find 5. There are always pleasant surprises to be found in the stock market – companies whose achievements are being overlooked on Wall Street. Rule 21: If you don’t study any companies, you have the same success buying stocks as you do in a poker game if you bet without looking at your cards. Rule 22: Time is on your side when you own shares of superior companies. You can afford to be patient – even if you missed Wal-Mart in the first five years, it was a great stock to own in the next five years. Time is against you when you own options. Rule 23: If you have the stomach for stocks, but neither the time nor the inclination to do the homework, invest in equity mutual funds. Here, it’s a good idea to diversify. You should own a few different kinds of funds, with managers who pursue different styles of investing: growth, value small companies, large companies etc. Investing the six of the same kind of fund is not diversification. Rule 24: Among the major stock markets of the world, the U.S. market ranks 8th in total return over the past decade. You can take advantage of the faster-growing economies by investing some portion of your assets in an overseas fund with a good record. Rule 25: In the long run, a portfolio of well-chosen stocks and/or equity mutual funds will always outperform a portfolio of bonds or a money-market account. In the long run, a portfolio of poorly chosen stocks won’t outperform the money left under the mattress.